In ice water shocks his tiny heart to beat. Gordon Parks would grow up to become a professional photographer, cataloging American life on film for the Farm Security Administration, Office of War Information, Standard Oil, Ebony, Vogue, Fortune and Life. His early work (1940-50) is the focus of an exhibition at the National Gallery of Art in Washington, D.C. from November 4, 2018 until February 18, 2019. He is also the subject of Carole Boston Weatherford’s biography, Gordon Parks: How the Photographer Captured Black and White America. 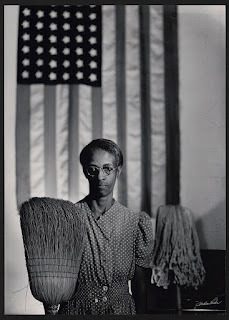 · Ella Watson lived in Washington, D.C. in the 1940s. · What do you think she hoped for her grandchildren? For students whose grandparents are living, have them find out their hopes for their grandchildren. Write about it or share those hopes with the class. Students can also imagine what they might hope for their own children. · Ask students to write about three things in their own daily lives that they would photograph – and why they selected these people, events or places. Parks was not only a photographer. He wrote a novel, directed a film and wrote poetry and music as well. · If you wanted to change people’s minds about an issue in society, what do you think would be the best medium and why? 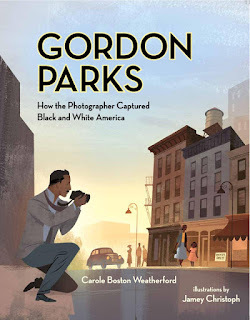 Gordon Parks is one of many famous Americans profiled by Carole Boston Weatherford. She is the 2019 Children’s Book Guild Nonfiction Award winner and will speak in Washington at the award celebration on May 11, 2019. Make plans to come and hear what she has to say – students welcome!